The new card game Monsters vs Heroes: Victorian Nightmares, a thrilling mash-up of Victorian mystery and horror stories, is now shipping to distributors and will start to hit the stores in US on March, 2nd. The English edition of the game will be available in other countries in the following weeks. 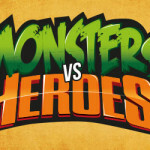 Monsters vs Heroes is a fast and fun card game, designed by Enrique Dueñas. The first volume, "Victorian Nightmares" is set in the streets of Victorian London, and includes two different decks - "London after Midnight" and "Sherlock in Hell", each of them containing 30 character cards and 6 faction cards. They can be used separately to play with 2 to 4 players, or together to play with up to 8 people. The rules of Monsters vs Heroes: Victorian Nightmares are now available in PDF format - click here to download. To learn more about the game, read also the preview article.